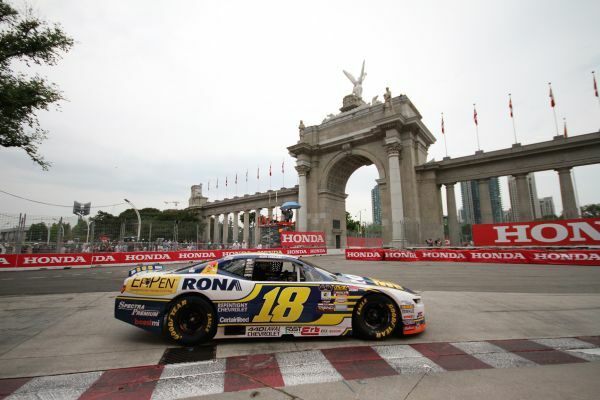 Alex Tagliani was hit by a little bit of hard luck in Round 4 of the NASCAR Pinty's Series held Saturday afternoon at the Exhibition Place urban course in downtown Toronto. Starting from the pole, his first of the season and the ninth of his NASCAR Pinty's career, Tagliani led the first 35 Pinty's Grand Prix of Toronto scheduled laps, posted the fastest race lap with his EpiPen-RONA-St Hubert Chevrolet Camaro ZL1, but an accident caused by Kevin Lacroix on lap 30 resulted in a full course caution that pushed the race into NASCAR overtime. On the restart on lap 36, in his fourth try, Andrew Ranger, who had been tailing Tagliani all race long, finally went by Tag on his way to the chequered flag. In the same restart, Jean-François Dumoulin bumped his way past Tagliani, but on the following lap, Tagliani retook second place to finish only 1.148-second behind Ranger. JF Dumoulin took third place ahead of Gary Klutt and Louis-Philippe Dumoulin. "I only like winning, but this is one second-place finish that I am happy about. Finishing second with a pole and most race laps led, gives me just about the same amount of points as first place. It is good for the championship chase," Alex Tagliani said. "Still, winning would have been better. I am happy to have finished this race after a few bumps in the last restart. We got banged pretty badly and when I saw smoke from the tire coming out of the rear of the car, I thought not again. But I'm just glad we finished the race because the points are so important right now. "Going into Saskatoon and Edmonton's oval tracks, we know how to improve the car to make it turn better after our run at Autodrome Chaudière where things did not go too well. Our car should be competitive out West. Our goal is to come out of the Western swing with maximum points. If we can achieve that, we will be in the hunt for the title. However, Andrew Ranger will be a tough opponent from now on." Nineteen drivers started the race with 15 crossing the finish line at the end of the Pinty's Grand Prix of Toronto. Fourteen cars finished on the lead lap. The race was under full course caution four times for a total of 12 laps. 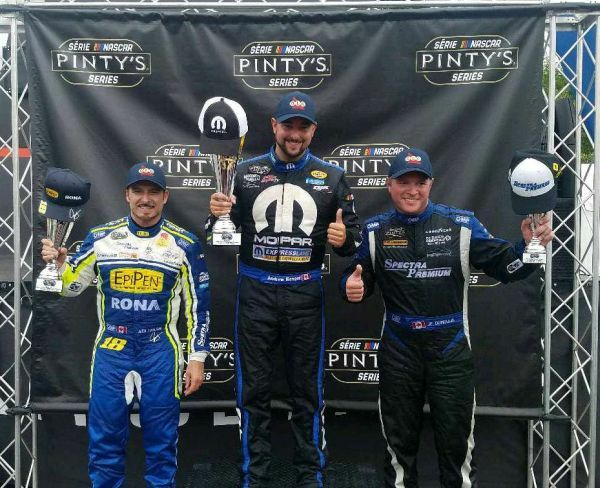 The Pinty's Grand Prix of Toronto will air on TSN on Saturday, July 21 at 2:30 p.m. ET. In the point's chase, Tagliani moves up to sixth place with 149 points, only 18 back from new points leader Andrew Ranger. In 62 NASCAR Pinty's Series starts, Tagliani has six wins, nine poles, 24 top-fives and 40 top-ten finishes. The NASCAR Pinty's Series now take its annual Western trip to Saskatchewan and Alberta for a three-race showdown. The first two contests will be held in Saskatoon at Wyant Group Raceway on Wednesday, July 25th for a pair of 125-lap feature races and the third event, a 300-lap affair, will be held on Saturday, July 28 at the Edmonton International Raceway.